Cyclope capsule is an active, intelligent traffic indicator that can be used to improve the safety of crosswalks. It recognizes when a pedestrian or bicyclist is approaching a crosswalk and automatically warns drivers by setting off flashing blue and white LED lights, letting drivers know that someone is coming into the crosswalk and giving them adequate time to react. When a pedestrian steps into the motion detector’s range, Cyclope capsule sets off the other indicators within the same configurable radio network. Unlike some other crosswalk warning systems, which activate only at twilight, Cyclope capsule is active on a 24/7 basis, i.e. also during the daytime when there are usually more pedestrians. The blinking of the device can be seen well also when it is light. Cyclope capsule is invisible to pedestrians. Only drivers see the indicators. By having a crosswalk area highlighted the amount of pedestrian accidents can be effectively reduced. Cyclope capsules are mounted to a crosswalk’s existing traffic sign poles at both side of the street, offering protection for pedestrians and bicyclists traveling in both directions. The installation work is not a project, it only takes a few minutes per device. Cyclope capsule is operated by two lithium metal batteries and it has a very low energy consumption rate, the batteries last for 2-3 years in normal use. The colors of LED lights and reflective tapes can be adjusted to comply with the local regulations. 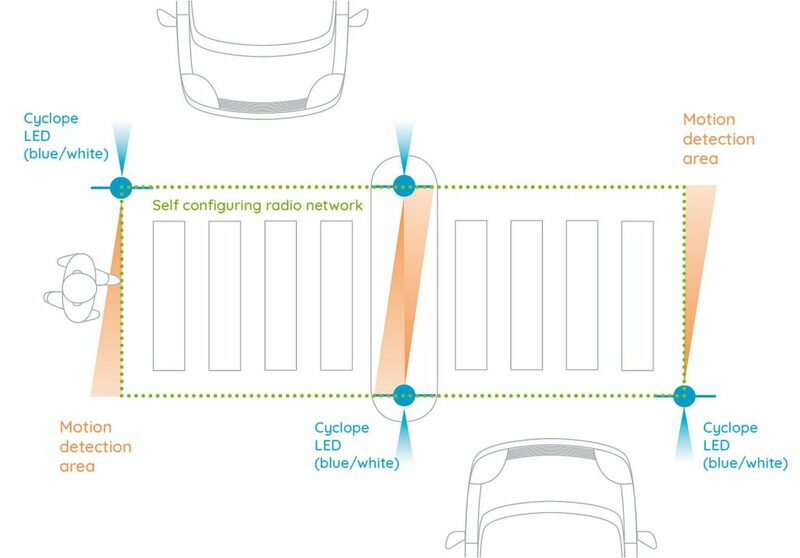 Cyclope capsule is a flexible and cost-effective alternative to traditional means, such as speed bumps or traffic lights, for highlighting a crosswalk area. According to two studies, Cyclope capsule reduces driving speeds, and lower speed levels has been proven to reduce accident rates. Cyclope capsule was the winner of “Vision Zero 2.0” – the international traffic safety competition arranged by the City of San Francisco in 2015. Cyclope capsule is designed for use primarily in populated urban centers and locations with high accident risk, such as neighborhoods where there are schools, kindergartens, sports and recreation facilities, and nursing homes. The device can also be utilized to protect tunnels, bus stops and parking lots/buildings, and it is well suited for areas where lightly travelled routes intersect. The intelligent device recognizes pedestrian movement and automatically sets off the flashing blue and white LED lights.